By changing tack and making Chesterfield harder to beat, Gary Caldwell has bought himself more time. The formation used at the Proact on Saturday hinted at a desire to avoid defeat, from a man likely aware of how ugly things might have gotten had Coventry romped to victory. 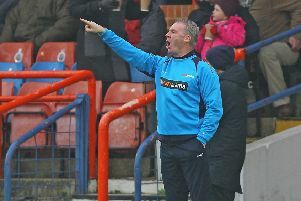 A defeat, particularly a heavy one, could well have brought his thus-far difficult time as Town boss to an abrupt end. Let’s not forget that it was fan opinion and the lack of bums on seats at Bradford City that did for Danny Wilson. Where the masses go, the decision makers often follow. Supporter derision over the performance of Dean Saunders was also highlighted as a major catalyst in the Welshman’s sacking. Make no mistake, there are great swathes of the Spireite fanbase who have lost all patience with the Scot. The attendance on Saturday should be particularly troubling for all concerned at 1866 Sheffield Road. A total of 3,721 home fans took their seats for the clash with the Sky Blues – the lowest number for any Football League game at the Proact since it was built. Add to that the fact that almost 600 season ticket holders failed to show. However, with his 4-1-4-1 system, Caldwell came out of the game with a point, a clean sheet and some credit – particularly because his team yet again failed to complete 90 minutes with 11 men. The draw was thanks in part to Tommy Lee’s sublime goalkeeping and Coventry’s woeful finishing, but at the very least it wasn’t a defeat. What the 0-0 result must become is a base upon which a major turn-around in fortunes is constructed. It must be a line in the sand. Caldwell simply cannot afford to go to Crewe Alexandra this weekend and get tanked. Some momentum is needed now, to win back a little trust in the stands, to buy even more time and breathing space. In all fairness, another draw would be a decent result, but it would further fuel the suspicion that the manager cannot inspire Chesterfield to victories. Crewe will be desperate to avoid becoming only the third club to taste defeat at the hands of his Spireites. Maybe setting up in a similar way and being hard to beat is the way to steady the ship, before growing into a more expansive or exciting style. Having been backed to bring in even more players, Caldwell can have no excuses and has to now, finally prove he can lead this team into form.